We were supposed to be flying in the air. That turned out not to happen – we got stuck in a motel in Cairns. A delayed departure for the first flight led to a chain reaction of missed connecting flights all the way to Juneau. Systemic failure. So they postponed everything 24 hours and we try again tomorrow morning, same time, same place. Malingering around Cairns, I took a very long walk, from our suburban airline comp hotel to the downtown waterfront. I’ll post pictures when I get a better internet connection. 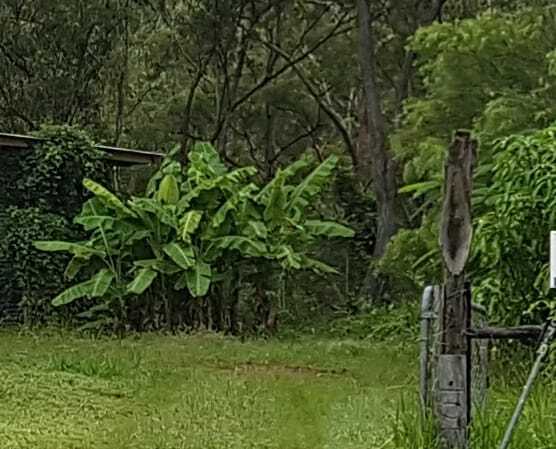 Meanwhile, a banana tree (or two).